The preliminary-round match between David Cameron and Micheal Unterbuchner went all the way to a tie break in the deciding set. 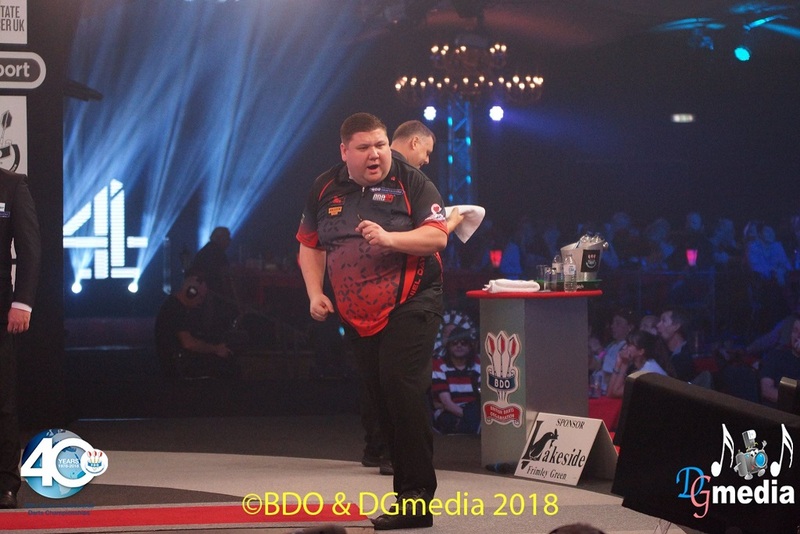 Unterbuchner found a last-dart double top to stay in the match in the sixth leg, then held and won the match at the fifth attempt with a break in the eighth leg. The German now meets No 3 seed Jamie Hughes in the first round. Daniel Day made a Lakeside debut that must rank among the best seen at the home of darts. The baby-faced marksman from Romford took out jaw-dropping finishes of 136, 132 and 99 in his straight sets win over New Zealand's Craig Caldwell. 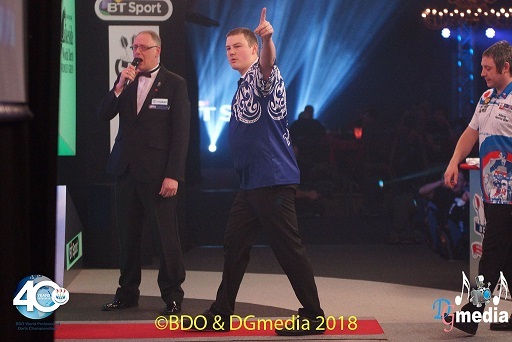 Day dropped just two legs during a confident debut and now meets Welsh veteran Martin Phillips, twice a semi finalist at the Lakeside, in the first round. Day has described Phillips as "a legend." Danny Noppert meets No 2 seed Mark McGeeney in the last 16 after a straight sets win over Richie Edwards. Edwards, a late replacement for James Hurrell, won just a single leg. 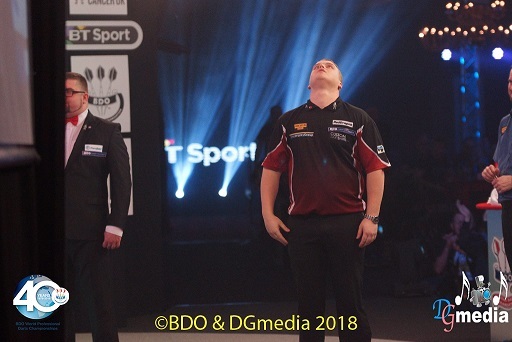 Noppert put his first three darts of the match in the treble 20 and outscored Edwards, restricting the Welshman to only one dart at a double in the opening two sets. That dart at double 18 in the second leg landed just on the wrong side of the wire - and Edwards didn't get another dart at a double until the opening leg of the third set. He found double 12 for a break, but by then, he had a mountain to climb. Noppert raced through the opening two sets without dropping a leg, really finding his rhythm in the second set. He broke in the opening leg, took out 322 in seven darts to hold and then wrapped up the set with a 121 check out. Edwards got a break in the first leg of the third set, but couldn't build on it and when he got chances to break again in the third leg, he missed and Noppert ran away with the match. 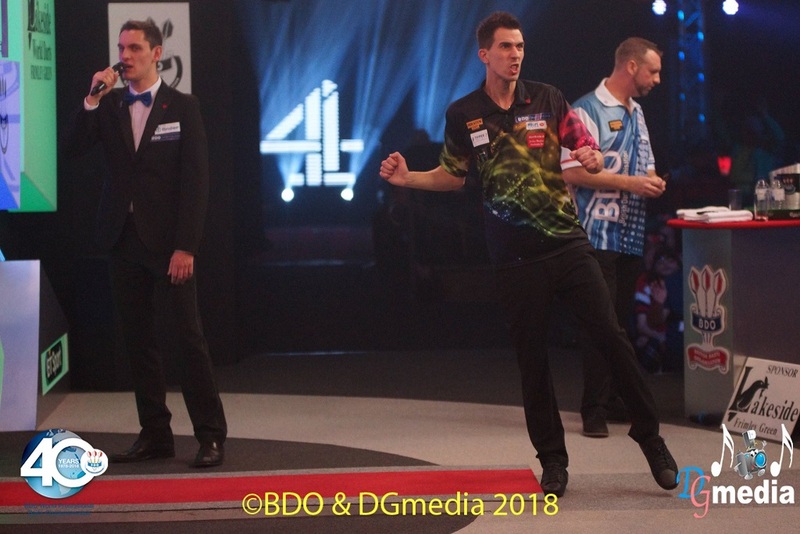 Lakeside debutants Andy Baetens and Scott Baker slugged out a five-set thriller that went the Belgian's way in a tiebreak. He now meets 2015 World Champion Scott Mitchell in the last 16. 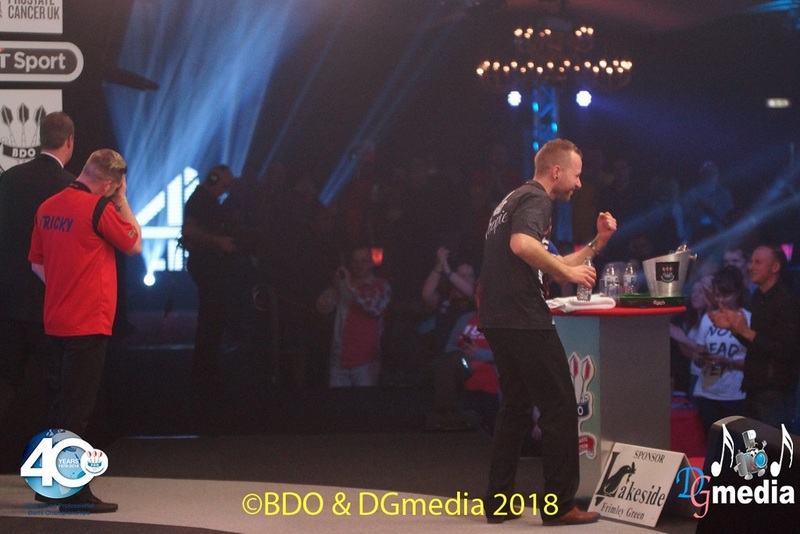 Baetens missed a dart at the bullseye to win the match in the fourth set and after they traded ton-plus finishes, the fifth set went to a tie break. The seventh leg proved to be crucial. Baker missed five chances to break and was still trying to shake off the disappointment when the eighth leg got underway. Baker started with 60 and 45 - and Baetens put his first five darts in the treble 20 to set up a match-winning 12 darter. 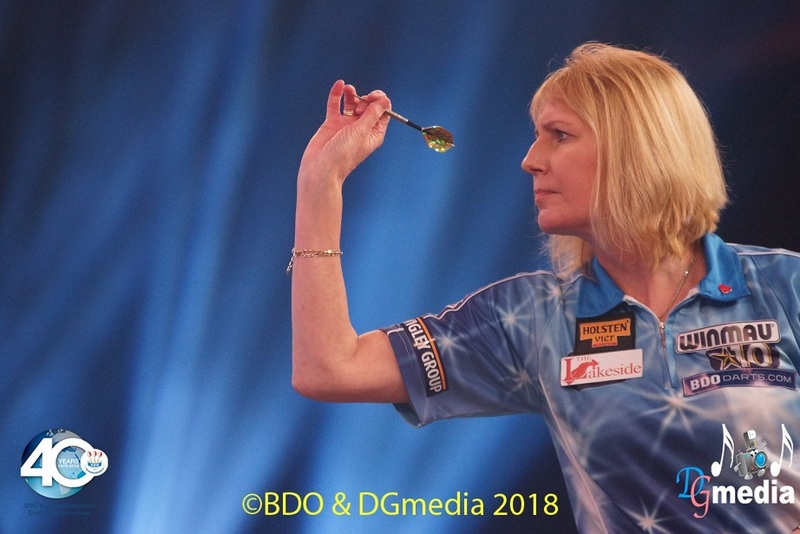 Trina Gulliver had to be at her best to see off Vicky Pruim, throwing two maximum 180s and having checkouts of 125 and 88 in a come-from-behind 2-1 win. Gulliver went a set down after missing two darts to take the first set but drew level by taking the second set. Then outplayed Pruim in the deciding set to win the match. The Swede did not even get a dart at a double in the last set. No 12 seed Dean Reynolds held off a fightback from Chris Harris to win 3-1 and set up a second-round clash with Scott Waites. Reynolds was 100 per cent on his doubles in the opening set and went on to add the next. But Harris has a quiet, almost silent, self-belief and grabbed the third set against the throw. Reynolds said that "refocused him" and he went on to throw his best darts of the match in the fourth set. He broke in the opening leg, took only 13 more darts to pull further clear and mopped up a 70 finish for the match. 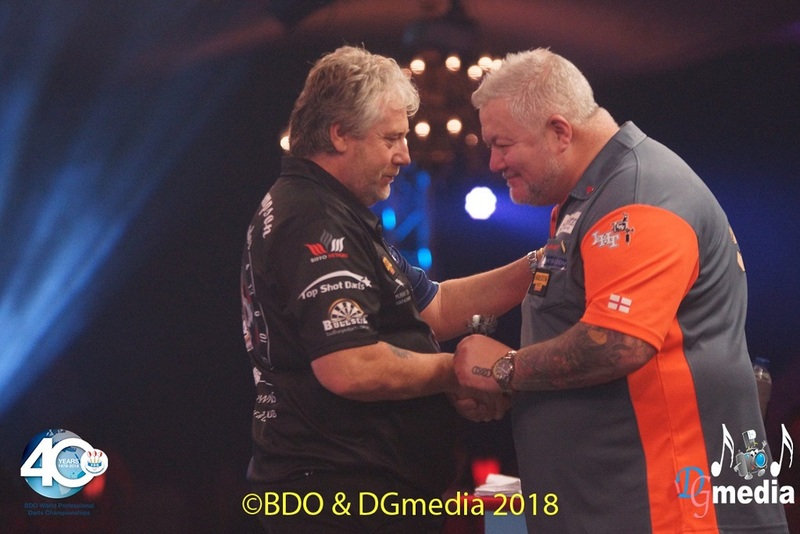 Lakeside favourite Darryl Fitton conjured up an exclamation-mark ending to a gruelling first-round clash with Justin Thompson. Both players struggled for form in the opening four sets - and then Fitton lit up the Lakeside in the fifth set tie break. He left himself six darts to take out 170 for the match in the sixth leg - and needed only three for the highest possible check out. Gary Robson had previously had the championship's highest check out, a 158 against Pengiran Mohamed. Fitton, troubled by a hip injury, now meets defending champion Glen Durrant in the second round and said: "There's no pressure on me. I'm not worried about playing Glen Durrant. Why should I be?"